How do you know if you need an anti-inflammatory diet? You have chronic pain for one. In the last blog, I mentioned symptoms or conditions that can result from too much inflammation. These include chronic pain, auto-immune diseases (Lupus, arthritis, Crohn’s, Colitis, MS and others), IBS, rosacea, skin rashes and sometimes just older age! 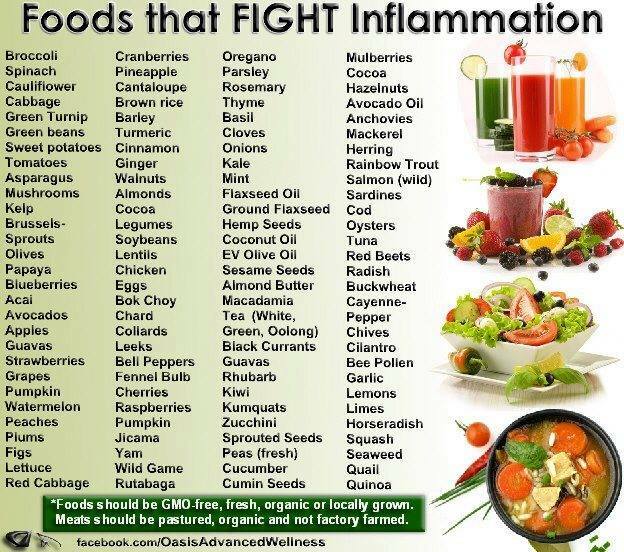 I personally believe everyone should be on an anti-inflammatory diet. 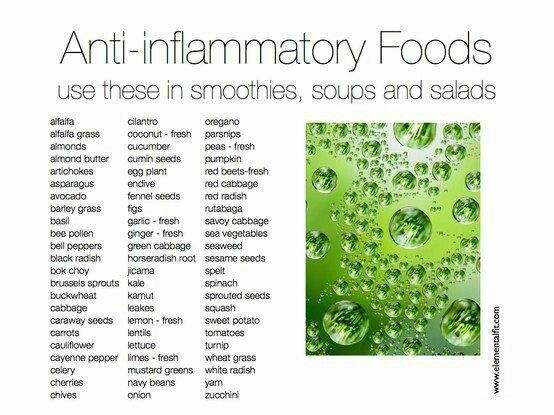 And anti-inflammatory diet is also great for injuries or recovering from surgery. But how do you start an Anti-Inflammatory diet? When I started my journey with the anti-inflammatory diet, I started with my Detox Plan. I did the 2 week plan, then developed the Detox Plan for Athletes and the Mini Detox Plan. I also tried juicing fast at one point successfully for 2 days. At that point, I did not have the hip pain. But as the pain developed, I started do more anti-inflammatory measures. I started with eliminating the processed foods, then wheat. I learned Nutrition Response Testing which helped to identify things that were aggravating my hip. The first were sugar and wheat. Then brown rice syrup. Then some virus, then petroleum/alcohol based products. Each month I did the Nutrition Response Testing session, I found something else that was aggravating my hip and making it hurt. I also optimized the supplements I was taking until eventually, the hip was not a weak link and I was with little pain. After each test, I would eliminate that aggravating food, or stop slathering my sore with Aquaphor (petroleum and isoproplyl alcohol are the main ingredients!) I found some anti-inflammatory supplements that worked really well (Inflavanoid IC and OmegaGenics 500 Concentrate by Metagenics) and used the Nutrition Response Testing to optimize the dosage. I was then able to give up the Advil and the potential damage to my liver from chronic NSAID use. Part of the process is to eliminate the aggravating food and finding a supplement as needed to speed up the healing. Part of starting an anti-inflammatory diet is to start paying attention to the signals your body is giving you. Pain is a signal that something is not right! A skin rash or itching is another sign. GI or brain fog distress is yet another. I eliminated the sugar and wheat first. Those are both highly inflammatory. Every time I ate it, my hip would be cranky and achy for the next 24 hours. I had to eliminate those first for 2 weeks to 2 months. Then when I reintroduced it, I made the connection between my pain and the food I ate. It was like night and day sometimes! The pain was so bad, I was perfectly ok not to eat anything containing sugar or wheat. But at holiday time, I would indulge in a few bites of a cake or brownie or cheesecake. I knew that if I ate more than 2 bites, I would be in pain. Last December, I had a piece of my friends homemade pumpkin cheesecake. She makes awesome cheesecake, so there was no way I was going to not have some! It was so good, I had a second sliver. OMG, I had to take 2 Advil before I went to bed, then woke up at 2 AM to take 2 more as the pain was so bad! It was the triple whammy – sugar, wheat and dairy. All inflammatory. But it tasted so good!! Was it worth it? Not sure. I realized that I had additional emotional layers that were causing my pain. It was emotional pain rooted in feeling abandoned by my family in another city, who did not make time to talk with me when I called for the holiday. I had done many The Path To Heal sessions to clear that emotional pain. And realized that having done many sessions over the year helped to clear other energetic blocks I was storing in my hip. I recall one training session for The Path To Heal where my hip ached. I could not sit still in class. In one of the sessions, something lifted and I went for a walk outside with no pain, no discomfort and felt like I was moving gracefully too! I skipped down the street! I did a Path To Heal session weekly to find and clear those blocks energetically. If I woke up with pain, I immediately did a session. I also utilized reiki and acupuncture in my pain treatment regiment. How do I start an Anti-Inflammatory diet with my clients? I have them complete the initial paperwork for a nutrition coaching session which includes 4 pages of food diary logs. They usually sign up for the 4 session package. I need to see what clients are eating and when the pain is worst to be able to assess what the first step is. I utilize this anti-inflammatory chart and work with the client to determine what we need to do first. One of my clients decided it would be much easier to eliminate sugar than wheat to start. So that is where we started. No processed sugar – brown sugar, white sugar, corn syrup or sugar substitutes. So far so good! items like green vegetables, cabbage, kale, parsley, turmeric root, pineapple, rosemary and Omega-3 fatty acids. This is when I introduce the Nutrition Response Testing for the clients who can see me in person. I also suggest adding the Green Monster drink (preferably in the juice extractor) with added turmeric, parsley, pineapple, cabbage and beets with the greens. This I called the Hyper-Anti-Inflammatory elixir! And for me, it really worked and I still drink it 4-5 times per week! For me, it was a process that was 6-8 months working on the food. But I was already steps ahead of most of my clients, so it may take you longer. It takes time. There is no instant fix. Starting on an anti-inflammatory diet is one step at a time, and can be a different step for each person. How you start on an anti-inflammatory diet is much easier when you have help. The only things you really have to do is start! Bye bye pain and inflammation! hello happy life. Joanna K Chodorowska, BA, NC, TPTH is a sports nutrition coach helping you use real foods as often as possible. She helps you to connect the dots between the foods you eat, and the symptoms you have. While suffering thru a debilitating degenerative hip condition and hip replacement surgery, she perfected the anti-inflammatory diet. She understands how hard it can be and presents alternatives of foods you can eat, not just a list of foods to avoid. She can make it easier for you to start an anti-inflammatory diet tailored to you! Hi Joanna, thanks for sharing this post, it’s very well written. Eliminating certain foods from my diet has helped tremendously with controlling my inflammation and flare ups. I just finished reading this article over at https://www.totalbeings.com/organic-total-body-reboot-review-heres-what-i-really-think/ and would love to get your thoughts on a detox cleanse when dealing with inflammation. Thanks heaps again for the tips, I’m sitting on the fence if I should sign up or not…Cheers! I believe in a hands on approach with most of my clients as to what it is they need. Inflammation is not just for losing weight. Yes, many of my clients have weight issues as well and doing an elimination protocol based on what they are eating seems to work best. I have a Detox Plan for Athletes that sounds similar to the program link you sent. It has 79 recipes in it to include as options and substitutions for the other meals so it is not just following the meal plan options only. This topic can be rather complex, so I usually suggest working on a more specific plan for each person so we can identify what IS the best protocol for that person to follow. I have had clients lost 16 pounds during the Detox Plan for Athletes plan, and continue to lose as they maintained a mostly clean diet. My specialty is inflammation – so I love working with each individual to customize what it is they need, and transform their lives so they can have fun again.